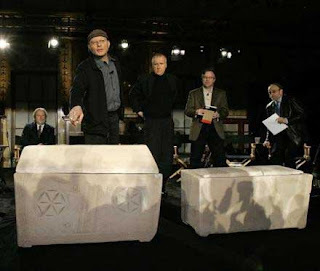 Recently, ‘The Lost Tomb of Jesus’, a documentary broadcasted on the Discovery channel claims to have found the lost tomb of Jesus and his family. It was directed by Simcha Jacobovici while James Cameron (yes the same Titanic director) served as the executive producer. The documentary has been widely criticized by the church and religious leaders as expected. But surprisingly it has been panned by the academic community as well. The documentary makes this exorbitant claim mainly on the back of inscriptions found on six ossuaries in the tomb, some fancy statistics and probability, and DNA. The names found are “Yeshua bar Yosef” (Jesus, son of Joseph), “Maria” (a latin form of Mary), “Matia” (Matthew), “Yose” (Joey/Joseph), “Yehuda bar Yeshua” (Judah, son of Jesus), and “Mariamene e Mara” (Mary the master). Later DNA sampling suggests that Yeshua and Mariamene are not related to each other and hence the makers conclude that they are husband and wife, with Yeshuda being their son. The Discovery channel hired statistician have concluded that the probability of these ossuaries being that of Jesus Family as 600 to 1. But eminent archeologists are of the opinion that there isn’t much significance in the findings. For one the names mentioned were all common names at the time. It therefore doesn’t prove that this is indeed the holy family. 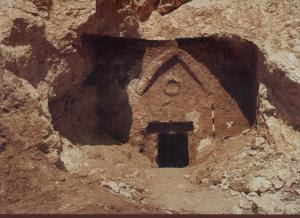 Even the man, Amos Kloner, who first found the tomb, is not convinced that this is indeed the tomb that would change history. He is skeptical of the documentary's claims and has termed it as pure coincidence that the names were all found together in the same tomb. As for DNA testing only Yeshua’s and Mariamene’s DNA were tested. 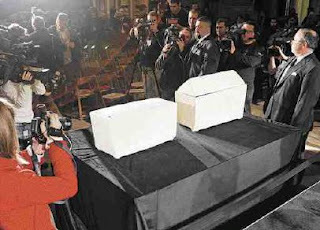 There was no testing done to ascertain the relationship between the remains found in the other ossuaries. Surprisingly no radiocarbon testing was done to ascertain the dating and time period of the remains and there by further sustaining the supposition that the Yeshua and Mariamene were indeed man and wife. There are even denials by the same people who had participated in the documentary. They claim to have been misquoted in the documentary. The forensic archaeologist involved in the documentary even asserted that he had NOT concluded that the remains of Yeshua and Miriamne showed they were husband and wife. In fact, he had logically stated, "you cannot genetically test for marriage." It looks like the makers in an effort to sensationalize the story have forgotten the basic scientific procedures to be followed while making such claims. It definitely looks like a botched up job where the makers sacrificed credibility for sensation. James Cameron who would know all about sensational discoveries should have exercised more restrain before coming out with the story. At best it looks like a half baked effort and at worst an eagerness to jump onto the Da Vinci Code bandwagon. The makers of the documentary comes across as trying to clutch at anything from wild assumptions to fancy play with numbers for supporting their claims. This is sad as it could have been an excellent opportunity to prove once and for all that a great man named Jesus did walk on the earth. Even though it would have brought down some of the traditional beliefs of Christianity it would nevertheless have given the world a new perspective and point of view on the various aspects of the religion. I think the makers would have made more of an impact and at least a bit more takers for their claim if they had made it a work of fiction like Dan Brown’s Da Vinci Code. When they made their claim through a documentary they were forced to provide conclusive evidences which they failed to do. Or maybe we are all taking this a bit too seriously. 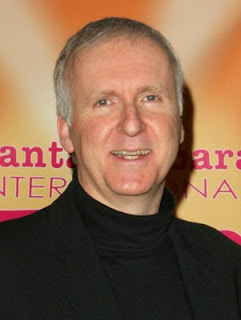 James Cameron’s true intentions maybe is to create a lavish production on the lines of ‘Titanic’. It would be fun to Leonardo Di Caprio and Kate Winslet as the holy couple. Other than that there seems to be no scientific value in the discovery as of now. How Jesus and Judas are the same !!! hey, keep up the good work...!!! It forgives but my English is low, goes to see if I become to understand; As well as with the "Code of the Vinci" if it wanted to mine the fact of the deity of Jesus and the Eucaristia, and it was not obtained, but it relieved much money, also now, is wanted to weaken the faith in the resurrection. Without arguments, but the evil is sown. E many Christians, as many catholics as evangélicos will be affected, mainly the ones that do not study, do not deepen its faith. The film goes to relieve for cineastas the good money. The objective for they will be reached. The remaining portion does not interest them. Finally, because the Jesus if becomes target of as many attacks and questionings? Strong Bruno Archbishop answers: "Evidently, because Jesus, in the deep one of the culture of the Ocidente and of the Ocidente, not only constitutes a so decisive and important control point that everything what he affects it, in he affects them". Thank you very much for you visit and thank you also for your kind words.